Eucomis plants are deciduous, summer-growing bulbs. There are 11 species of Eucomis, all growing in Southern Africa and one growing only in the Fynbos area around Cape Town. 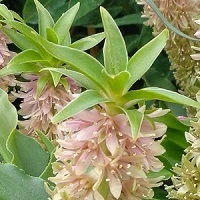 Eucomis is part of the hyacinth family, which includes English bluebells. 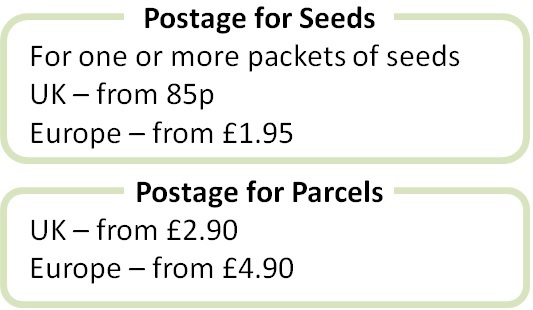 Check our shop for seeds when we can find them and for Eucomis bulbs - generally for sale in the spring. All are known as Pineapple Flowers after the unusual shape of the flowerheads. All Eucomis flowerheads have a crown of leafy bracts, mostly commonly white or pale yellow in colour, and looking uncannily like a pineapple. These plants are all half hardy and can tolerate frost to around -7°C. As these are summer growing plants which die down in the late autumn, in warmer parts of the UK the bulbs can be left in the soil and covered with a thick mulch of leaves or straw in winter. Otherwise grow in pots to bring indoors or lift the bulbs in late autumn when the leaves have died down and replant in spring (March – April). By division: New plants can be created by removing the offsets from mature bulbs during the dormant period in late autumn/winter. Offsets can take some time to form. Once removed, keep the offsets in a cool dry place over winter and plant out in spring, generally March – April. When planted, the tips of the bulbs should be level with the surface of the soil. By seed: Eucomis plants are easy to raise from seeds, although they can take a while to germinate. They can be sown anytime using a heated propagator set at 20-24°C. Otherwise sow in late spring/summer in the UK. Sow in deep containers with space for the young bulbs to develop. The seeds take 4-6 weeks to germinate (sometimes longer in my experience, so don’t give up) and should be planted out in the third season when they generally start to flower. By leaf cuttings: In summer, remove an entire leaf and cut into five sections. Plant the sections in a well drained seed mix and keep in a warm humid environment. Tiny new bulbs form in one to two months. Eucomis plants grow best in sun and fertile well drained soil. They flower best if composted in spring and kept well watered during the summer. They are low maintenance plants once established.